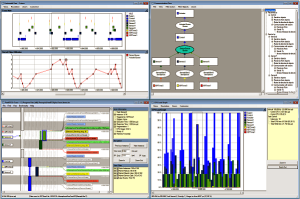 Houston, TX – February 2, 2011 – Quadros Systems, Inc., a leading supplier of configurable and scalable real-time operating systems (RTOS), today announced RTXCview, a powerful system trace and profiling tool for embedded systems. RTXCview works as a companion to traditional debuggers, providing a revolutionary visual insight and understanding of the runtime behavior of embedded systems using the RTXC RTOS. Such things are often very difficult to figure out from studying the code alone. Debuggers are not particularly effective in analyzing such problems in a debug session because a debugger does not address the problems at the desired level. The rough timing of a problem’s appearance is often known but why something goes wrong at that time is what has to be determined. In the end, the developer is left with that age-old recourse of designing and developing test cases that isolate the problem into a repeatable situation. Only then are the questions of who, what, when and why answerable. The result is a lot of extra time and expense focused on problem resolution and can be a major factor in the increasing cost of software development. Other system concerns include performance issues such as system responsiveness or throughput. The system can be optimized if the developer can successfully manage the relative timing between tasks. Yet this is simply a trial-and-error exercise if there is no way to understand moment by moment system behavior. RTXCview allows the developer to study the detailed runtime behavior of the system as it actually occurred, even in real production code settings RTXCview addresses the questions of who, what, when and why by presenting the runtime information in a unique, highly efficient manner. Traditional runtime viewers show time in the horizontal axis and code entities vertically, similar to a Gantt chart. In systems with only a few tasks and ISRs, the user can spend a lot of time just moving the visible part of the presentation to see what code entity is actually active and for how long. RTXCview shows everything on a scalable timeline using the vertical axis, allowing the user to zoom in and out to get a different look to address the question of when. The unique presentation allows for zooming in on details, down to microseconds, but also gives a good overview when zooming out over several seconds. The question of who can be easily determined because tasks, threads and interrupt service routines are clearly shown in color-coded sections along the timeline when they are in control of the CPU. Color coding the entities eliminates the need to move focus all over the screen just to locate an actor. In addition, the presentation method also shows the level of interference from higher priority entities, a very important schedulability consideration usually beyond the capability of the traditional runtime viewer. RTXCview addresses the question of what by showing the timing of kernel services issued by the task, thread and ISR actors. And again, the scalable timeline allows zooming in and out for less or greater detail of this information. The result is a clear understanding of how much time is used for each operation and how these operations (or actors) relate to other operations in frequency, order and timing. Upon seeing all the information addressing the questions about who, when and what, the answer to why usually becomes clear, leading to a rapid resolution of the issue in question. The RTXCview product consists of two parts: a recorder in the RTXC kernel that runs on the target processor and logs system and user events in the target RAM, and a viewer?the RTXCview tool that runs on a host PC. Instrumentation code in the RTXC kernel service APIs and other important places in the kernel invoke the recorder to store data. The recorder uses a ring buffer to store system data on a continuous basis but the developer can make decisions on when to begin recording and what data to capture so that the trace file is focused on the problem area. The viewer component of RTXCview presents a unique visualization display to look at the performance of the system over time. And there are other views that show statistical information about processor usage, system loading, execution time and even response time on an entity by entity basis. An example is shown in the screenshot in the top-right area labeled “Actor Information”. Even though the recorder might collect the user’s selected set of data, the user might choose to present only a subset of that data, thereby simplifying the presentation area of interest. Selection of the displayed classes or objects is under full user control. 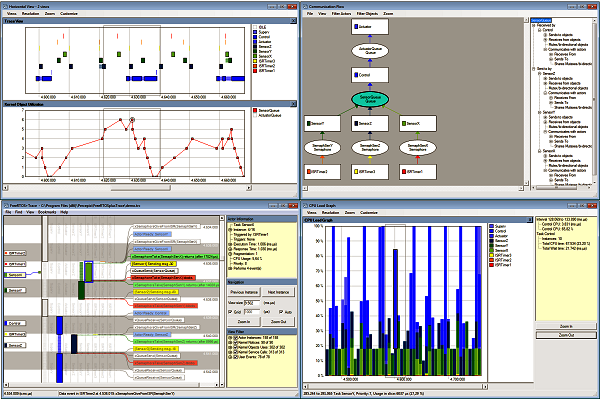 RTXCview is available in two versions: a Basic Edition, offering standard features and a Professional Edition, for advanced users who want to “tune” the tool for greater insight. Developers who use RTXCview can avoid “flying blind”, preventing costly field failures by better understanding the interactions of system components. User studies have shown that complex timing problems (sometimes referred to as Heisenbugs) can be identified in minutes rather than hours or days using RTXCview. RTXCview System Trace Tool is available immediately. It is licensed on a per seat basis starting at $1500. For more information please visit www.quadros.com/RTXCview.